Ventricular septal defect may present with three different form such as membranous ventricular septal defect( the commonest form), infundibular ventricular septal defect and muscular ventricular septal defect ( the least common). Ventricular septal defect is associated with fetal alcohol syndrome and Down syndrome. Patient who suffer from ventricular septal defect may present with symptoms and signs such as pansystolic murmur at the left sternal edges. 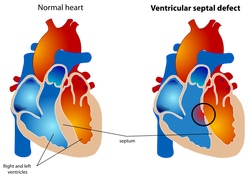 Ventricular septal defect is part of the non cyanotic congenital heart disease. There is left to right shunt due to lower pulmonary vasculature. The complication of ventricular septal defect are cyanosis at later stages, pulmonary hypertension and paradoxic embolism. The treatment of ventricular septal defect may include surgical correction. However, small ventricular septal defect may close spontaneously. 1.Rudolph, Abraham M. "Ventricular septal defect." Congenital Diseases of the Heart: Clinical-Physiological Considerations, Third Edition (2009): 148-178. 2.Minette, Mary S., and David J. Sahn. "Ventricular septal defects." Circulation 114.20 (2006): 2190-2197. 3.Penny, Daniel J., and G. Vick III. "Ventricular septal defect." The Lancet 377.9771 (2011): 1103-1112.